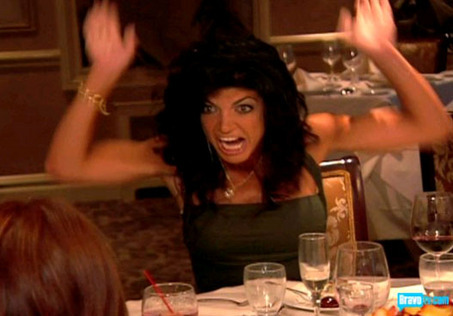 This thing is one of the “housewives” on “Real Housewives of New Jersey.” She’s Teresa Giudice and she is its star. Make her a “hosewife” because some suggest she’s hosed everyone within arm’s reach. Court papers suggest that she’s a fraud, phony and deadbeat. I say she’s most entertaining, and that’s all that counts in my world. The show is the guiltiest of pleasures and provides universally accepted permission to mock, ridicule and laugh at people who are actually and obviously developmentally stunted, and it’s OK. This quintet of Botoxed and surgically-enhanced Italo-American harridans are evolution run amok. And I love it. These women have nothing to add to society except for their high and mighty deluded sense of self-importance and relevance. This is high opera of the lowest substance. Here’s Teresa with her Boeotian hubby, Joe, whose IQ I would estimate at somewhere between soap dish and dart. This atesticular, whipped man has been sentenced to live with this termagant and seems to enjoy it. Only a cerebrally bereft paramecium could have possibly agreed to marrying this woman. Imagine being a fly on the wall overhearing their deep conversations and musings. But all that counts is how they amuse me. And thank Zeus their addiction to self-promotion outweighs any self-respect. But it seems that all’s not well in Camelot. Here’s what the New York Post reports on the finances of these two putative deadbeat “Italian” poseurs. The bank has moved to foreclose on the Giudices’ $1.8 million, 10,500-square-foot, eight-bedroom, 5½-bath marble-and-onyx manse in Towaco, NJ, the couple moved into during the first season. Teresa and Joe defaulted on their $1,280-a-month payment for the family’s ubiquitous black Cadillac Escalade. They also didn’t have insurance on the massive SUV, according to GMAC. Teresa — who this season told Joe to get a vasectomy — owes $12,000 to a Garden State fertility clinic. * Banks have taken the couple’s $279,000 four-bedroom Jersey Shore house. The Giudices had three mortgages on the house and owed $325,000. The couple also handed over a $200,000 home in Lincoln Park, NJ, that had four mortgages — and an outstanding debt of $600,000. * Teresa and Joe owed another $1 million for property in Clifton, NJ, that has been given back to lenders. Joe, who “owns several successful businesses throughout New Jersey,” according to his wife’s Bravo bio, owes more than $5 million, including debts to former partners associated with his Section 8 real-estate deals. They’re financial wizards. How did they ever get approved for one mortgage much less twelve or whatever? How does a couple with $79K between them secure a mortgage for a $2M manse? Wow. But who cares? I love his show. I admit it. My wife and I watch it as regularly as we can. It’s a train wreck. A lab experiment gone bad. A group of the most empty nothings you’d ever want not to meet deluded under a fantasy of alluring sexiness. And I love this fugazy rich broad too. I shan’t ever forget her scene where she tried to turn the last supper table over. As you recall, on cue the deadbeat “diva” waxed furious over Danielle, the most Botoxed woman ever (I mean ever) over something (it doesn’t matter) and delivered a series of high-pitched caws of “HOO-WUH!” And we’re not talking Pacino’s “Scent of a Woman” exceedingly annoying bit. This is hoo-wuh as in whore. And if the phrase it takes one to know one ever applied … . This was television gold. Gold. The source of Teresa’s over-the-top anger was this woman, Danielle. Rumors have it that Danielle’s mug graces the pages of many a plastic surgery textbook under the rubric: The Horrors of Excessive Botox. She has that arched brow, Jack Nicholson Joker look, typically seen among the hyper-Botoxed. May this show never end. May stupidity and craven, callous . . . well, stupidity, live on. Botoxed, big-haired and ballsy. Another slight to Italo-Americans and another unfair typecasting of New Jersey. Can #CreepyUncleJoe beat @realDonaldTrump in 2020? To those who said Biden wouldn't run, I TOLD YOU SO! LIONEL PODCAST: Attention, Sheeple! Everybody Out of the Pool!